In the blink of an eye, one of the most influential people in my adult life is gone. Back in 1990, I was working in a bike shop that has since gone out of business. This monster of a guy would come in every once in a while and talk to Todd Schmidt, one of the racers/mechanics at the shop. One day we got a delivery: a brand new Colnago Master X Lite frameset. It was the coolest bike I had ever seen. Turns out this was a bike Todd was building up for the big guy, Jeff Littmann. Jeff was still transitioning from bodybuilder to serious cyclist, so he looked like the Incredible Hulk compared to all the other noodle-armed cyclists we knew. Todd introduced me to Jeff, who was running all of the Vic Tanny clubs in Wisconsin. This was the pinnacle of the 90’s fitness craze, and there was no doubt Jeff was a rock star on the scene. 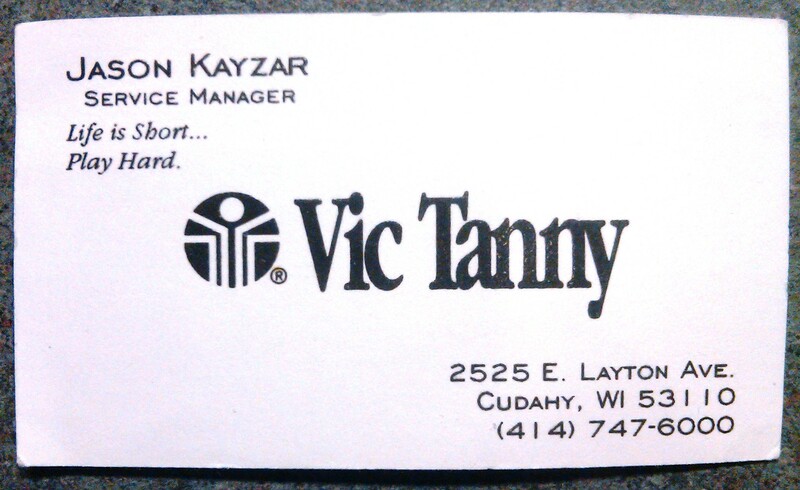 I asked Jeff if I could interview for a position at one of the clubs, and a few weeks later I walked into Vic Tanny in Cudahy for the first time… as the Manager. Jeff taught me about personal accountability and responsibility. He was a man of few words; you knew you were doing things right when he didn’t say anything, and if he opened his mouth, you were in trouble. The few times Jeff did say something positive to me, it stuck like glue, and I hung on to it for weeks. He walked the walk; working in the Clubs around the clock, 7 days a week. If the toilets in the club were dirty, he cleaned them – then whoever was supposed to have cleaned them got an earful. He was a polarizing person, everyone had an opinion about him, but he was always Jeff. I have met very few people in my 20 years since then that are that true to themselves. Jeff taught me to stand up for my values, and be true to myself. Jeff giving me that chance also allowed me to meet my best friend, Mark Lampe – a guy cut from the same cloth. Littmann began training with Kurt Kuettle, a trainer at the clubs who had been a strength coach for the Brewers. Jeff would bring in a seat post with his seat on it, and you’d see them wheel a stationary bike into a tiny office and close the door. Minutes later Kurt would be screaming at Jeff as he put him through interval after interval after interval for what seemed like hours. Over the years, Jeff’s 100% commitment to fitness never wavered. His life revolved around it until his very last memory. I’m certain that I will never meet another man like Jeff – the world truly lost a superstar today. Wow. This is simply shocking and very sad. Jeff was a stand-up guy of few words, but his words counted, even on group rides. I’ve probably been on 50 group rides with him and there were never sleeves on his jerseys and he was great. He will be missed. I met Jeff when he bought a bike from a bike shop that I worked in back in the late 80’s. He came in and bought these awesome bikes that I would drool over. I even help build one. I raced for Vic Tanny/Patio Bike after I met him. I was not super successful as a racer, but it was fun, and he encouraged me with his energy and enthusiasm. He was a great guy to know and my heart sank when I hard the news. You will be missed Jeff. I knew Jeff back when I was a manager at Vic Tanny Health Club in the mid 80’s. Jeff was a real mentor to me. He pushed me and showed me how to set and achieve goals. I still remember his calls at the end of the day asking me how we did. I’m a better person today because I knew him. He will be missed. My thoughts and prayers go out to his family and friends. I am sad. The cycling world that stretched far further than you would have ever thought and for the most part likely didn’t even know cries for you and your family. Pray for the fool that hit him and his partner as well. They will have their own continual personal torture. Jeff was the consummate professional in everything he did and all that will be said about him will not scratch the surface of his depth of character. I know him only from an occasional and historic cycling encounter. Those short encounters left a mark. Kinda like “meeting a Gandhi” kinda thing. Over the course of my only recently personally acknowledged blessed cycling history, I’ve met and raced with many influential people in this sport. Superweek, Heiden, Young, LeMond on and on. I feel very fortunate to have known Jeff, even to the small degree I did, and to be able to add him to the list of people who added to my life. This is a beautiful tribute to Jeff! With so many people expressing thanks for having known him, it is heart wrenching to think that his big spirit has left this earth. He was a very important part of my life for many years. All I can do is give thanks for that time and send prayers to his family so that their pain is eased. I am deeply saddened by this. I knew Jeff – I used to work for him when I managed one of the Vic Tanny (now Bally’s) clubs in Milwaukee (Fox Point). I had lost touch with him LONG ago, and had no idea he was a fellow bike racer and cyclist. Tail winds Jeff, tail winds. Touched by the word, haven’t seen Jeff since he attended my wedding in 1996, lost touch over the years. I had the privilege to work for Jeff at Bally’s in Chicago, and Jason is spot on in his description. Jeff was kind, the real type of kind, not because it was the right thing to do, because this is who Jeff was at his core and one of the best motivators I have ever met. What set his movation skills from the other greats I have encountered was 1 single thing – he truly meant and believed every word, no hype – just pure, true passion and heart felt guidance. Today the world losses a great man, and heaven gets him. Thanks, Jeff – for being an example of why the human race was created. Jeff & I met when we both managed health clubs in the Milwaukee area many years ago. He was a vibrant individual, always with a big smile and confident in what he was doing and the direction he was going. We weren’t really close friends but had mutual respect for each other and I felt he was a decent guy of whom you could trust. Even though it’s been years since we’ve crossed paths I am sad to hear of his passing as my heart goes out to his family and friends. We’ve lost one of the good ones,.., ride on, brother!